Sugary Drinks & Dental Health, What's the Link? Green Bay, WI – Since many people are now aware of the health problems associated with sugary drinks and carbonated beverages like soda, they have been turning in large numbers to alternatives like sparkling water. In fact, carbonated water sales have skyrocketed in recent years, leading many to wonder if these drinks are a safe alternative to their sugary cousins. The pH scale is a measurement of how acidic or basic solutions are. A neutral liquid like pure water has a pH of 7.0; an extremely acidic substance like battery acid has a pH of 0 to 1; and a very alkaline (basic) compound like bleach has a pH of 13 to 14. The pH of our own body varies by region; stomach acid can range from a pH of 1 to 5, depending on whether the body is resting or digesting. Overall, our blood tends to maintain a slightly alkaline pH of 7.35-7.45. When teeth are exposed to acidic liquids, this can lead to erosion and ultimately breakdown. The good news is, the body strives for homeostasis, usually maintaining its pH balance. In the mouth, this is done by saliva production. Saliva acts as a buffer against harmful acid, and is partially responsible for preventing tooth erosion. 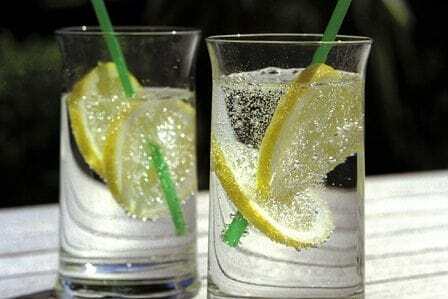 Plain carbonated water consists of carbon dioxide added to water. When these chemicals are combined and ingested, they produce carbonic acid. This acid, not the bubbles, produces the tingling sensation people experience when drinking carbonated beverages. There is a wide array of carbonated water available today, including many types of: seltzer water, mineral water, club soda, and tonic water. The more sugar these drinks contain, the more damage they will likely do to teeth. The same can be said for flavored water, particularly those that contain citrus flavors like orange, lemon, or lime. Rinse with plain water. For those who choose to consume drinks other than water, it’s helpful to rinse their mouth out with plain water afterward to help negate some of the potentially harmful effects on the teeth. Decrease the frequency of sipping. It’s best not to sip sugary, acidic, or carbonated beverages throughout the day. If possible, such drinks should be consumed only at mealtime. Drink through a straw when possible. Using a straw helps minimize the drink’s direct contact with tooth enamel and can prevent a bit of wear and tear. Wait an hour after eating before brushing. It usually takes some time for the mouth to remineralize the teeth after being exposed to acidic substances. Chew sugar-free gum. This can increase saliva production between meals, helping maintain the mouth’s pH balance and prevent dry mouth. Brush with a fluoride-containing and/or remineralizing toothpaste. Pairing a soft toothbrush with toothpaste that has fluoride can cut down on tooth sensitivity and promote tooth strength and health. If you’re worried about tooth erosion or decay, contact our office today to schedule your appointment.